If you think the best thing about New Year’s is all the festive flares and bangs, you might want to reconsider, as firecrackers injured almost 400 people in the Philippines, while 800 cars were set ablaze in France, not to mention the Dubai skyscraper. A drunken man lit a firecracker called Goodbye Philippines in Manila that reportedly looked like a stick of dynamite. It exploded in his arms and killed him, Janet Garin, Secretary of the Philippine Department of Health, told reporters. “His jaw was shattered. He was so intoxicated he hugged the Goodbye Philippines,” Garin said, adding that paramedics had transported him to a hospital, where he was declared dead. 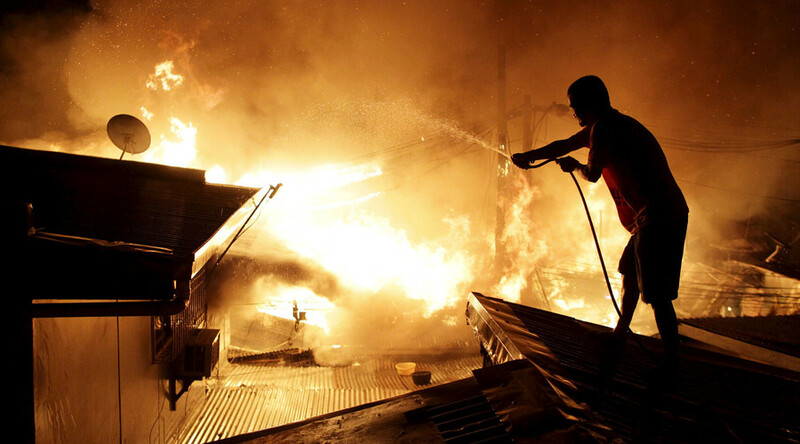 In another accident in the same city, a firecracker set a stray hut in the Tondo slum district on fire, resulting in about 1,000 shanties being burnt to the ground and several thousand families without a roof over their heads, fire officials said. Janet Garin has called for “a total ban on all firecrackers.” However, this may be not be feasible since, by tradition, many Philippian revelers believe that firecrackers and loud sounds scare away bad luck and evil spirits. French police detained 622 people during this year’s New Year’s festivities, half as many as last year, French Interior Minister Bernard Cazeneuve reported, according to AFP. About 300 were later placed under arrest. “This shows that security forces now work with greater efficiency,” the minister concluded. Despite this new “efficiency,” more than 800 cars were still set on fire overnight in France, in contrast to 940 in 2014. Security measures in the French capital had been stepped-up due to a series of atrocious terrorist attacks in the Paris on November 13. In Germany fifteen people were injured by fireworks at a New Year’s party, local media reported. A firecracker was accidentally fired right into a crowd of people who had gathered to watch a fireworks display at a country hotel in the town of Datteln. A 24-year-old woman was reportedly injured so badly that she had to have her foot amputated. Similar reports also came from Bengkong Palapa in Batam on the Riau Islands of Indonesia where six people were injured and one killed after several powerful firecrackers exploded simultaneously, The Jakarta Post wrote. Nearly 25 people suffered injuries on New Year’s night in Moscow, Russia’s capital, according to Interfax. In the Krasnoyarsk region of Siberia, two girls, aged 7 and 1, tragically died after their New Year’s tree caught fire. The blaze started when the fairy lights on the tree shirt-circuited, TASS reported. New Year’s celebrations were almost ruined in Dubai, when a massive fire erupted in the 63-story Address Hotel, which is located not far from where the fireworks display took place. All of the occupants were quickly evacuated, but 14 people were slightly injured, and 60 were treated at the scene for mild smoke inhalation. Celebrations and fireworks went ahead despite the blaze, which was extinguished after an all-night effort by firefighters. However, when the sun rose, plumes of smoke continued to tower over the 302-meter building, and when it set again, another fire was reported in the luxury hotel, though a much smaller one. It wasn’t firecrackers, but gunfire that left five people injured at a party in New Orleans, when an attacker in a dark sedan pulled up and opened fire, according to NBC News. One of the victims is reportedly in critical condition.